Want to set the perfect ambiance for your home or business? LED Distributors is here to help! We are proud to offer the latest in lighting technology. Some LED lighting options that we offer include LED under cabinet lights, flexible LED strips, and RGB flexible Ribbon LED Strips. Any of our options are sure to give your home or business a new distinct look! Here is our color changing flexible led strips that we offer. 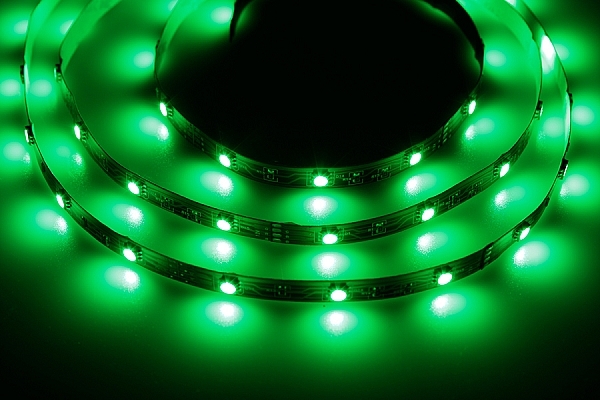 Our RGB Flexible LED Ribbon Strips comes as a flexible circuit with an adhesive 3M backing. You can cut strips to any size (as small as 3 inch increments) and position them almost anywhere! When using this type of lighting, a controller allows you to easily shift and select the colors you want for your room, while maintaining energy efficiency all at the same time. Just press a button, and you are ready to set the mood for any occasion. *Sold by the Foot* (ie. if you order a 3 feet, you will receive one 3 foot section. I installed the color changing LED lights to a 2007 Toyota Tacoma PreRunner. The installation was a breeze with the indicated strips and fasteners. The whole installation was about an hour and a half with prep time included. They are bright and functional and have stood up to the vibration of an off road truck. I am very satisfied with the product and would recommend to car enthusiasts from novice to professional.